Did you know that you can now enjoy 1/2 priced bottles of wine twice a week! You heard right… every Tuesday & Thursday you can explore our collection, including our reserve list, for half the price. Just our way of showing our appreciation for your continued loyalty and support. Join us at Vinnie’s Steak House this week to enjoy some good company and some great food! Chef Tom has prepared some outstanding dishes that will have you feeling happy and satisfied. 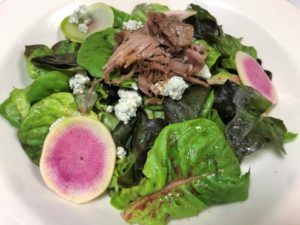 Our Fresh Featured NC Salad this week is a Warm Duck Confit Salad, with Mixed Baby Lettuces, Roquefort Cheese, Watermelon Radishes, tossed in a Pickled Beet Vinaigrette. From our friends at Locals Seafood, we will have fresh NC Triggerfish. Stop by or call to see how Chef Tom will be preparing one of his favorite NC catches. In the Tavern, try our featured Burger made with Certified Angus Beef topped with Prosciutto, Swiss, Whole Grain Mustard Aioli, and Pickled Red Onions on a Pretzel Bun. 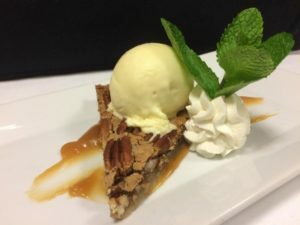 Hope you saved room for dessert, because this week we have our NC Pecan Tart served with homemade Mint Julep Ice Cream made with the first fresh Mint from Chef Tom’s own herb garden. Our Warm Duck Confit Salad consists of Mixed Baby Lettuces tossed in a Pickled Beet Vinaigrette, topped with Warm Duck Confit, Roquefort Crumbles, and Watermelon Radishes. Did you know that we get our Pecans right here in NC! This week we are featuring our NC Pecan Tart topped with homemade Mint Julep Ice Cream. Make sure you save room for this refreshing treat.